Join us for the annual Spring Fest to celebrate the gardening season. We’ll have $10 deals all day like selected $10 shrubs, trees, gift shop specials and more. Pottery and outdoor furniture will be 20% off for the day. For the younger set, we’ll have a gardening project, face painting and a chance to visit with Teton Valley’s cutest baby farm animals. Face painting and animals are available from 11-2. Great prizes will be raffled off throughout the event and we’ll have free gifts for our first 50 paying customers. This is one event you will not want to miss! Vegetable gardening is a growing trend for so many reasons: health, economy, variety and taste are just some of benefits to growing vegetables at home. A bit of planning up front really pays off in the productivity of your garden. Here is part one of a two part series intended to guide those beginner gardeners or serve as a resource for those who have experience. •	Choose a site with at least 6 hours of direct sunlight and good drainage with no low, wet areas. •	If possible, choose a site sheltered from wind and near a south facing wall for radiant heat. •	Try to stay away from trees and shrubs that send up shoots such as aspens, cottonwoods or chokecherries. •	Keep your garden small at first and expand as you learn what works for you. •	The soil should be dry before being worked to avoid compaction. •	Add lots of organic material (compost, aged manure, shredded leaves) to improve soil condition, fertility, drainage, nutrient and water holding ability. •	Soil can be warmed up faster by putting a layer of clear plastic over it for a few days before planting. •	If possible, consider building raised beds for gardening. There will be better drainage, the beds warm up earlier and there is less bending or kneeling. •	Don’t plant tall plants or build trellises where they will shade other plants. •	Crop rotation is important for healthy crops. Try not to plant the same vegetable in the same place year after year. •	Keep any paths or walkways wide enough for a wheelbarrow. •	Follow the instructions on the seed packet. 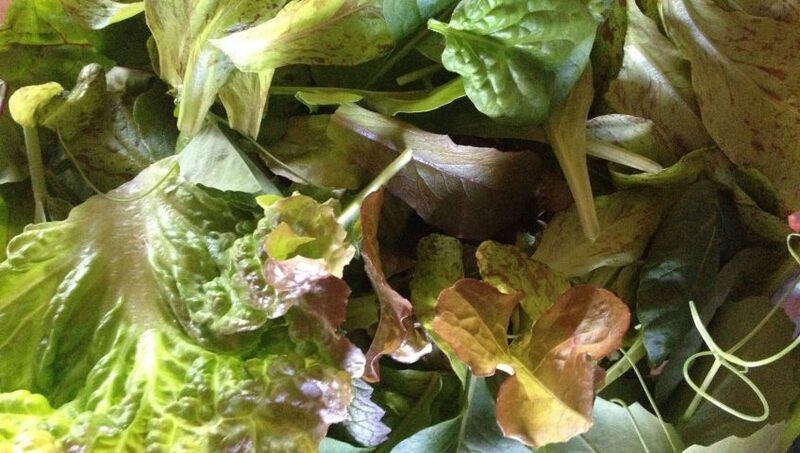 •	Spinach, peas, potatoes, radish, and greens like kale, Swiss chard and arugula can be planted late April through May. •	Wait until June to plant warm season veggies like beans and squash. •	Many vegetables are available as seedlings or starts. Long-season veggies like tomatoes, cabbages, broccoli and peppers are best to plant from starts. We mountain people love our dogs and outdoor spaces. 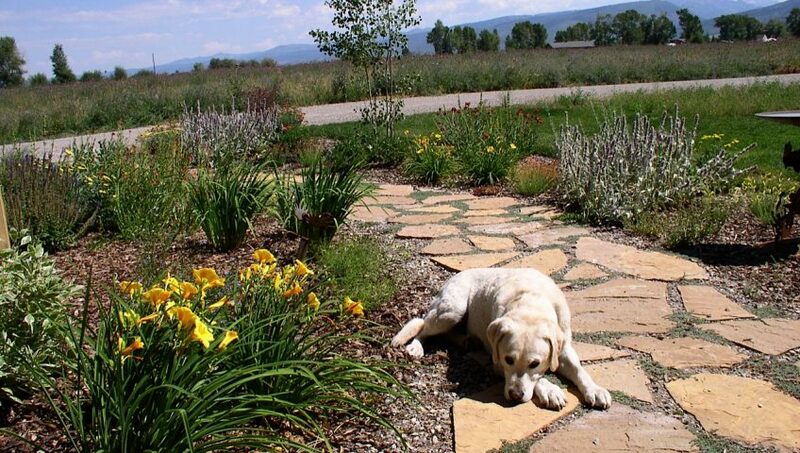 Dogscaping is intended as a way to be mindful of our dog’s needs while keeping our landscaped outdoor areas comfortable and beautiful for humans too. If you are planning your landscape from scratch, lucky you! Here is your chance to incorporate some dog-friendly ideas from the outset. If you already an established landscape, these tips can help keep that landscape beautiful and comfortable for your pets and you. Comfort Zones: Planting trees and shrubs for shade throughout your landscape will provide a cool spot to rest throughout the day. A patch of lawn or the cushion of durable ground cover plants make comfy places to relax. Bare dirt, stone walkways or a sunny deck provide opportunities to keep warm and soak up the sun. Water Zone: At a minimum, provide a fresh supply of water for your dog outdoors. Water-loving breeds adore kiddie pools or natural water features for drinking and cooling off in hot weather. If you really want to spoil your dog, splurge on a commercially made pet fountain to provide cool fresh water at any time. Potty Zone: Dogs will typically choose a spot to relieve themselves routinely. If you are introducing a new dog to your landscape or if you are planning a landscape from scratch, pick an area for your dog to go potty. It could be as simple as a weedy patch or as elaborate as a special gravel area with some upright ‘marking’ rocks. With some training and encouragement, dogs will return to their potty spot. Be sure to make this spot accessible in the wintertime too. An extra potty path through deeper snow will help your dog stay on track. Choosing less toxic methods for pest or weed control is the best practice. There are plenty of effective, natural products on the market. Even if they are labeled natural or organic, it’s still important to keep your pets out of the product and only use products as directed on the label. Some dogs find organic fertilizers like bone meal or blood meal very attractive will eat or lick it off your plants. Be watchful and consider using liquid fertilizers that are absorbed more quickly. When cared for properly, turf grasses can withstand the traffic of playful dogs. Dogs love the cool and comfort of a lawn as much as humans do. What lawns do not love is the high concentration of nitrogen in dog urine. If your dog is continues to urinate repeatedly in the same spot, consider removing the turf altogether and replacing it with a gravel potty spot. To correct urine kill spots, rake out the dead grass, fluff up the soil a bit, sprinkle with lime and reseed. Continue to water the patch consistently until the grass germinates. Commercially made dog spot treatment products are also an easy and effective way to fix dead spots. Once established, many perennials can withstand the occasional run-though. Avoid planting anything with feathery, ferny foliage as these can quickly get trampled. Use fencing to keep dogs out of newly planted areas, highly valued flower beds or veggie gardens. Use traffic resistant ground covers like wooley thyme, creeping thyme, Irish moss, creeping jenny, snow in summer and lamb’s ears. Compost: If you compost at home, be sure to enclose it securely to protect your dog from eating it. The bacteria from decomposing food waste can cause an upset stomach or diarrhea. Doggie pool or fountain: Installing a water feature with Fido in mind will keep him or her cool on hot days. If that’s not in your budget, a simple sprinkler set on low can be entertaining for some breeds. Sensory log: Drill holes in an old log and fill with various essential oils or treats. Designated dig spot: A sand box with buried toys or treats is a great way to occupy dogs who love digging. Doggie ice lick: Simply fill a bigger yogurt or ice cream container with water and mix in some treats or toys. Perfect for hot days.